he became 75 and was retired by Pope Francis on the same day. (Vienna) Pope Francis accepted the resignation of Auxiliary Bishop Andreas Laun of Salzburg yesterday, the 100th anniversary of the last Marian Apparition in Fatima. Thus, in the German-speaking world, an outstanding figure holding the bishop's office has lost his office, who dared to raise his voice against the prevailing Zeitgeist. Above all, he is the last of a remarkable attempt at a course correction in the Church of Austria. The Moral Theologian belongs to the Order of the Oblates of St. Francis de Sales (OSFS). In 1995, Pope John Paul II appointed the son of an atheist who had converted to the Catholic faith as titular bishop of Libertina and auxiliary bishop of Salzburg. Libertina is a vanished bishopric of the Roman province of Africa Proconsularis, which belonged to the church province of Carthage and was located in present-day Tunisia. By the Islamic conquest of North Africa it vanished and is what could be seen as a reminder with regard to today's Islamization of Western Europe. Recently the City Council of the Austrian capital Vienna published figures showing that the Muslims in the age group 0 - 10 years already account for almost 30 percent. On the very day of his 75th birthday, Monsignor Laun was dismissed from office. You could say someone was in a hurry. In fact, Laun was the last remaining representative of a series of episcopal appointments with which Pope John Paul II wanted to achieve a renewal of the Catholic Church in Austria through a change of course. The fact that he would never be anything more in the Austrian Church was established in the second half of the 1990s. When John Paul II became pope, the revival of Modernism in the German-speaking world was already in front of everyone's eyes. Parallel to the Second Vatican Council, an unprecedented decline of the Catholic Church took place. John Paul II wanted to counter this erosion process. It is known from the history of the Church that real renewal, owing to the hierarchical composition of the Church, takes place only through a traditionally coherent action from below and above. For this reason, John Paul II wanted to give a new episcopate to Austria. Bishop's appointments are the only, really substantial possibility for the Pope to intervene in a local church. Since appointments are rare, however, this path takes a lot of time, which is not always sufficient. In the Apostolic Nunciature in Vienna, especially Titular Archbishop Michele Checchini it was rumored that the main driving force in the background was the Austrian Curial Cardinal Alfons Maria Stickler. In the middle of the eighties, Monsignor Egon Kapellari, Bishop of Gurk-Klagenfurt, was appointed a "conservative" or "best" Bishop of Austria in 1982 by John Paul II. His appointment had still prepared Cecchini's predecessors. With Nuntius Cecchini then it happened in one fell swoop from 1985 on. The most important personnel decision in the Church of Austria, the appointment of the Archbishop of Vienna, was the prelude to the day, when Cardinal Franz König, who was still omnipresent at that time, was sitting. He was followed by the Benedictine Hans Hermann Groër from Göttweig Abbey. The consequence was an outcry of the "modern". The Church is threatening a "reactionary turnaround," a "return to the past." From the first day onwards irreconcilable barriers were set up against the new Archbishop whom John Paul II had raised to the rank of Cardinal. In 1987, he was assigned an auxiliary bishop, the professor of systematic theology, Msgr. Kurz Krenn. In 1988, with an official appointment at the beginning of 1989, Msgr George Eder was appointed Archbishop of Salzburg and with that two of Archbishop seats of Austria were held by newly appointed men. As Primas Germaniae, Eder was allowed the purple. In the same year, the appointment of Monsignor Klaus Küng, the first Opus Dei representative on a bishop's chair in the German-speaking world, followed the Bishop of Feldkirch. Each appointment triggered violent counter-campaigns by the left-wing Church circles, which found reflexive support for Church-hostile media. In the same year the already over 79 year old Cecchini was replaced as nuncio. He was followed by Donato Squicciarini and a first toning down of the original line. Auxiliary Bishop Kurt Krenn was removed from Vienna in 1991, where he hoped to be one of the future Archbishops, and was appointed Bishop of St. Pölten. On the same day, the Dominican scholar, Christoph Schönborn, was appointed an auxiliary bishop for Vienna. The other appointments were listed under the keyword "moderate conservatives" and remained rather colorless. Only in Salzburg, at the request of Archbishop Eder, with the appointment of Andreas Laun, was there an appointment in the Cecchini line. In the same year, however, the attempt of John Paul II experienced a severe setback, which was soon to turn out to be an end. In March, one person made vague accusations of sexual abuse against Cardinal Groër. The background is still highly opaque. The media fell with pleasure on the matter, and the progressive Church circles sniffed out a unique opportunity. From this an efficient, albeit rather unholy alliance was formed, which successfully blew death on the prince of the Church. On the 13th of April of that year, Auxiliary Bishop Schönborn was appointed Archbishop-Coadjutor. It was clear at the latest that he and not Bishop Krenn would be next Archbishop of Vienna. With the effect that Cardinal Groër was made archbishop emeritus on 14 September, the Feast of the Crucifixion. In 2004 Bishop Krenn was struck down with a few other ingredients under the pressure of a staged campaign. The two main phrases of the course correction, which John Paul II had tried, had been chased out of office with shame and disgrace. Groër because of his rank and Krenn due to his outstanding intellect and his pugnacity, were feared by their opponents. The Church referendum and the 500,000 signatures had caused fear. Squicciarini was not Cecchini. From then on, Vienna's new Archbishop, Schönborn, had a weighty word to say, also in the case of episcopal appointments. When Alois Kothgasser was appointed Bishop of Innsbruck in 1997, Laun's career as the Auxiliary Bishop in Salzburg had already reached its final destination. The wind had turned. With the appointment of Kothgasser in November 2002 as the successor of Archbishop Eder, it was firmly established. Particularly active in matrimonial and family pastoral care, Auxiliary Bishop Laun, for more than 20 years as a bishop, defended the Catholic morality and natural law in an area which is receiving an ever more dangerous bombardment of a de-Christianizing the world and under the pontificate of Pope Francis within the Church, is sometimes called into question by the highest authority. That even brought Laun in 2017 a criminal complaint by homophilic SPD deputies. The Catholic doctrine has become so intolerable to many. Laun has referred to the affliction of many faithful priest as an "inner-Christian persecution by Christians." He also courageously raised his voice for unborn children as an auxiliary bishop. This is a theme that the dominant Zeitgeist has forced under a bell of silence. In the German-speaking world, the Catholic Church has also largely adhered to this taboo since the 1980s. Laun always consciously broke this wall of silence. Whoever has heard him speak about the unborn and the natural order knows what a weighty voice the Church has in him and yet instead of helping him gave him a muzzle. This last happened in October 2016 when he had to cancel his participation, including a speech to the Congress Defender of Europe in Linz, "at the insistence" of the new Archbishop of Salzburg, Franz Lackner OFM. 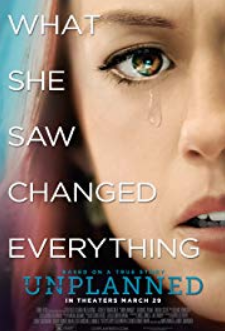 As a new initiative, the Congress attempted to articulate a counter-position to the impending loss of identity through mass immigration, multiculturalism, Islamization and genderization. The political left saw this as a threat to their cultural hegemony, which had to be immediately stifled. Laun's recall is symptomatic of the new timidity of the Church towards the temporal spirit, which some already see as a complete capitulation, clearly like Goethe's fisherman: "Half he drew them, half he put them back." "He regards the guardianship as an order to the bishops to pay attention to what Catholics, theologians, religious instructors represent as the doctrine of the Church," as Laun says; 'And if necessary, they should also intervene to correct: lovingly, argumentatively, but also with courage and firmness'. Some people would have 'scolded' him if he had defended "delicate positions of the church", for example, in the area of Pro-​​life. 'I am truly sad about those defeats which people have added to my own Church.' Even with his criticism of the provisions allowing abortion in the first three months, he had encountered contradictions in Church circles - even among people who at that time had signed the popular move against this law. In short, when I was a bishop as guardian, I was not infrequently defamed and attacked." The church has to talk "about God and not primarily about the climate and other fashionable themes", says Laun. It is always about "God or nothing," said the auxiliary bishop, referring to the title of a book by Cardinal Robert Sarah. "Jesus has not brought eternal peace, not the healing of all the sick, not the overcoming of all famines or the prevention of natural catastrophes, but He has brought God." As the publisher of the monthly Kirche Heute and his lectures, Laun goes beyond the borders of Austria and will certainly do so in the future as far as his health permits. 22 years ago, his appointment was part of a remarkable attempt to stop the decline of catholicity in Austria by changing the course of bishop's appointments. That his appointment was the last shows how long it has already been, that this attempt has failed. When Pope Benedict XVI In 2009, attempted to appoint the dogmatic theologian and country pastor, Gerhard Maria Wagner as auxiliary bishop of Linz, the alarm was sounded from the relevant side that the attempt to recover what had happened from 1985-1995 was imminent. It was immediately stifled in the bud. In Rome, cold feet were given to the published reaction. Even before Pastor Wagner could be ordained as a bishop and his office could be established, the appointment was again dropped. Five years later, Wagner described the state of the church in Austria with the words, "a pig stye which stinks". As an auxiliary bishop, Laun could not change much, and he was not allowed to be more. Austria. 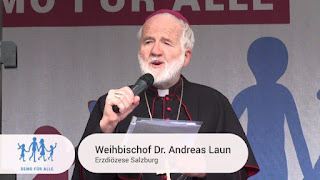 German speaking homosexual websites are overjoyed over the most recent statements by Auxiliary Bishop Andreas Laun of Salzburg. The prelate had previously warned about this on 'kath.net', that homosexual is seen as the worst sin above all. He even cultivated the illusion for them, with "your loving relationship with one another". With his commentary, Msgr Laun is relieved of being the "archconservative hater of homosexuals" -- happily declare the homosexual sites. The one time homosexual critic, he has now "turned around 180 degrees" . The Auxiliary Bishop stands supposedly in line with the Catechism, ready however on the ground for a "overcome" the same, wrote Wolfgan Bergmann -- anti-Church business manager of the anti-Catholic publication "Standard". In total, the homosexual sites have taken note that the Conciliar Church is garnering attention for its "homosexual friendly tone".